Fictionwise quietly retired the world's longest running ereader some time in the last couple months. You can still buy ebooks, but the hardware is no longer listed. It's a pity that they didn't announce it because it truly deserved an obituary. I was about to pull my EBW-1150 out of the closet and do a post, but I guess it's too late. 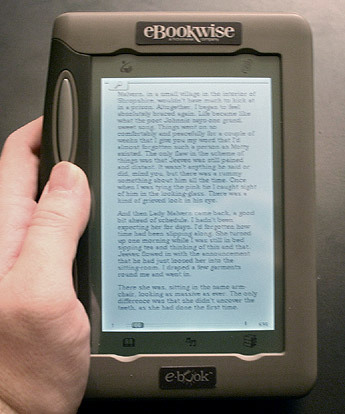 Ebookwise, a subsidiary of Fictionwise, launched the EBW-1150 back in November 2004 (retail was $99.95), and continued to sell it until the end of 2010. It had a 5.5" (320x480) grayscale LCD touchscreen, 64MB Flash storage, a Smart Media card slot, a USB port, and a modem. What's even more amazing is that the EBW-1150 was originally released in 2002 as the GEB-1150 (I have one), so this 8 year old hardware was still being sold in 2010. Impressive, no? It is a little surprising that it lasted so long, but until Kobo started the price war last spring, the 1150 was a relatively cheap ereader. For much of its life it had the distinction of being the only bargain ereader on the US market. This was a fun little gadget with a couple of surprises built in. Back in 2008, a couple hackers discovered that the 1150 had a (very basic) web browser. With the help of an app running on your PC, you could actually use the 1150 to surf the web. It didn't work very well, but it did work. You know, with the growth of sites designed to work on the Kindle, the browser would probably work better today than it did 2 years ago. It also was fairly capable as an ereader. It shipped with a dictionary and it supported bookmarks, typed notes, and scribbled notes. Now that I look back, I have to say that I'm surprised it didn't dominate the market in its early years. It was a decent value well into 2009. I know people who looked at the Kindle and then bought the 1150. Looks just like my wife’s. Her first and most beloved for a long time for reading in bed at night to not disturb me. I haz a sad. It could’ve been so much more than it was if they’d a) pushed it and b) made the format less proprietary. Very much so. All they needed to keep it competitive was to update it to use a big sd card vice smart media. Mine is still more reliable than any modern e-reader I have bought. NOOOOOO!!!! I LOVE MY READER!! I was about to go buy my daughter one!! … I’m still needing the converter… where can I go to get something to convert from RTF to IMP?? Damn you Chapters and your KOBO!!! I am about to buy a Color Nook but still love my 2nd eBookwise 1150 and my original Cybook. You just reach a point where you can no longer find the books you want to read. Damn! Should have mentioned the Cybook is also my 2nd – sold the first on eBay a couple of years ago for $265, immediately regretted it, and, after spending much time on the internet found one in new condition about 6 months later for $100. Still love it but slim pickens on Mobipocket.